Dr. Jim Schultz of Neighborhood Healthcare in Escondido reviews results of a patient’s retina exam. Dec. 16, 2016. Megan Wood, inewsource. That’s how physicians’ responded to surveys distributed in 2013 and 2015 by the California Health Care Foundation and the Medical Board of California to doctors renewing their licenses. 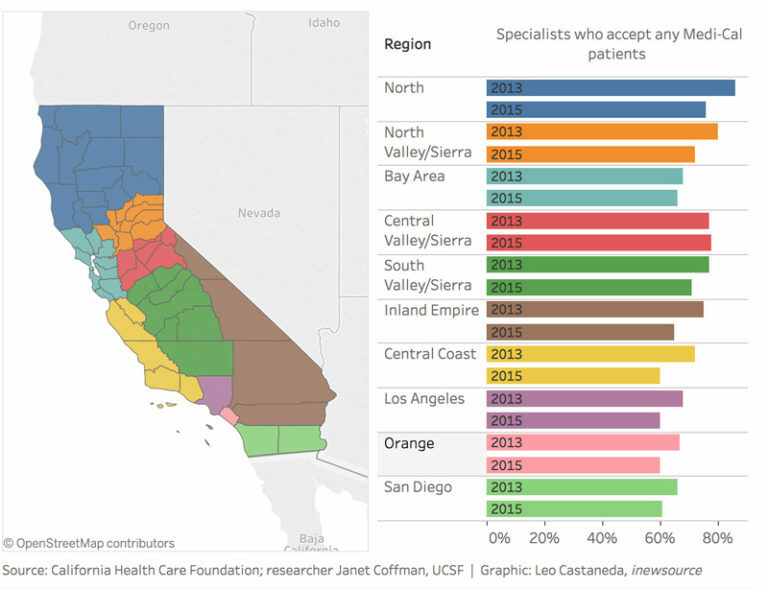 Here’s a look at how many doctors see Medi-Cal patients, who make up 35 percent of Californians. The San Diego region includes San Diego and Imperial counties, where Medi-Cal insures a total of 1 million people. Most of the regions include numerous counties. Click the photo to explore the data. Of San Diego area specialists, 54 percent in 2013 and 56 percent in 2015, said they would take a new Medi-Cal patient, the lowest rates in the state. 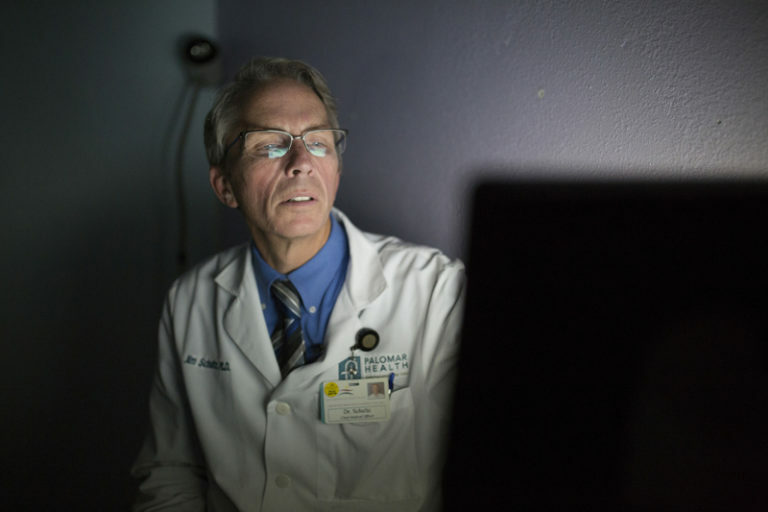 If Schultz’ patient in Escondido needs to see a gastroenterologist, he often has to send them to Chula Vista, 40 miles away, to see a willing specialist. And many Medi-Cal patients don’t have cars, which means hours on public transportation. The situation is less dire for Medi-Cal enrollees seeking a primary care physician because of San Diego’s array of federally-qualified health centers like Neighborhood Healthcare, all of which see about 1 million patients, Schultz estimated. The ACA provides much higher pay for primary care provided at those centers through a complicated formula. That situation could change depending on the outcome of Proposition 56, the tobacco tax increase that voters approved in November. It could bring between $1 billion and $1.4 billion a year to state coffers, a major portion of which is required to pay for Medi-Cal services in a variety of settings. How much physician’s pay will increase as a result, however, remains to be seen and depends in part on whether the $2 increase per pack will prompt more smokers to quit.